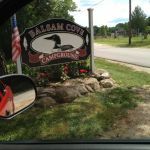 Ask fellow campers about "Balsam Cove Campground" and nearby attractions. The roads to the park are good, the entrance road into the park is gravel and a few of the tree branches are low, so take it slow. The roads in the park are good. Check in was fast and friendly. There are around 120 sites, mostly permanent/seasonal. The park is clean and for the most part quiet. Our neighbor liked their music on the loud side, and when we asked management if they could ask them to adjust the base level (not the volume) as it was vibrating our RV we were told it was not quiet time yet. 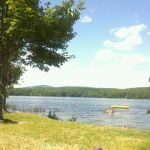 The campground is on Toddy Pond and has a beach and boat docks. There are lots of planned activities and breakfast and dinner on certain days. We were in Site 62, a gravel pull through with full hook ups. No issues with any of them. Site was not exactly level, even with our jack pads piled up our tires were still off the ground. There was a picnic table and fire ring. Lots of places for dog walking and a fenced dog park. WiFi was good as was our Verizon coverage. Laundry room was fairly clean. We stayed July 19-26, 2018 and paid $46.37 a night with our Good Sam Discount. We camped at Balsam Cove Campground in a Motorhome. My rate reflects an "economy" site - other sites up to $52. Sewer pipe so high that it was Above my outlet height so did not drain. Extremely high water pressure so make sure you have a reducer. Good antenna tv and cell phone from Bangor. WiFi speed so limited as to be almost useless - to knock out the permanent residents using Netflex etc. I'm sure, but 2 min. to load a google map is extreme and a YouTube video would not load at all. Nothing really here to draw campers except the little lake is probably why it was 80% empty end of July. Strict "early arrival - late departure" policy for extra fee and the high cost of sites seem to be a real emphasis on $$ for this campground which, for me, seems to be mostly a parking area with hookups. I would not stay here again. We camped at Balsam Cove Campground in a Fifth Wheel. Nice campground with large level grass and gravel sites and good utilities. The pull-through sites do not have shade but this made it easy to acquire a satellite signal, they do not have cable. The Wi-Fi worked OK but was slow at times and our Verizon signal would drop out at times. The dirt road into the campground is a little tight but not a big problem. They have a huge bonfire at the pond on Saturday nights and activities sometimes during the weekend. The young lady at the office was very nice and helpful. Tip: site 75 has a large cement pad, the only one in the campground. We would stay here again. We camped at Balsam Cove Campground in a Motorhome. We made last-minute reservations to stay here over 4th of July weekend, and they were very accommodating and helpful in finding us a spot for our tent camper. The only "bad" thing that I can say about Balsam Cove CG is that when the power goes out, as it did when we were there, the toilets won't flush; the toilets backed up and they were slow to respond to the problem. Other than that, they do a good job, and Toddy Pond is a beautiful lake! Definitely a good Maine campground! We camped at Balsam Cove Campground in a Tent Trailer. Went camping there with our daughter's family. We had a great time. Our trailer was parked across the road from the lake. Very family oriented campground with hayrides and bonfires if you like, plus other activities. We had full hookups so I can't say much about the restrooms. My husband showered there and said the showers were fantastic and restrooms were clean. This is one we'll go back to. We camped at Balsam Cove Campground in a Travel Trailer. First the good: Really pretty lake, and nice launch area for boats. Busy campground, but very quiet at night. The sites in the wooded area are nice. WI-FI was fast and reliable. AT&T signal good also. Only 10 miles to stores and supplies. Good for families. Really good blue grass band played on Saturday night. The bad: 125 sites, and only one extremely dated bath house that does not even supply hand soap. This campground is heavily used on the weekend by the permanents, weekend tent campers, and day use visitors. Bath house was cleaned on Thursday, and then not again until Monday. It was the worst pig sty I have ever seen by Sunday night. They spent a ton of money on the new section that is big rig friendly with 50 amp and full sewer hookup, but has no appeal with sites being basically in an open gravel parking lot. There is also no bath house in that section. The local weekenders and permanents here, that make up most of the camp sites, are not welcoming to the out of state campers at all. Rules are printed out and given at check in, but they were obviously not followed or enforced. Huge fires going in camp rings that turned into "smudge" pots at many permanent sites that were left smoldering all night and deposited heavy ash and soot all over our rig and tow vehicle. We won't be back. We camped at Balsam Cove Campground in a Motorhome. Half mile of narrow dirt road to campground, roads and sites dirt and gravel. No road and R/R noise. Plenty of room and long. Water, power good, cell (AT&T) low. Park is on lake. A few miles to town for shopping, restaurants, etc. We would camp here again. We camped at Balsam Cove Campground in a Motorhome. A terrific, family-friendly campground! We found it a couple years ago and come back every year. It has something for every type of camping experience. Open area, trees, and waterfront. Bring your boats or rent theirs. Fun for kids/grandkids, a new food pavilion, supplies, and safe atmosphere. The owners have done a lot of upgrades and it's become a seasonal park for many. I use Verizon broadband for internet, and signal was fair. Beautiful lake and attractions nearby including hikes and Craig Pond Salmon Hatchery. We come every year at least once and have a very enjoyable experience! We camped at Balsam Cove Campground in a Fifth Wheel. Beautiful campground on the lake. We were lucky enough to have a site right on the lake.The owner and staff are very friendly and helpful. Sites are clean and large with full hook ups on the lake. We would recommend this campground to everyone. We had a great time the first week of July here. We camped at Balsam Cove Campground in a Fifth Wheel. There is good and bad about this campground. The good: there is a new section that has been opened that will handle big rigs and has 50A electrical and full hookups. This campground is within 30 miles of Bar Harbor and Acadia National Park. The bad. The Wi-Fi in the new area was slow the further from the office you got. Another repeater is needed for the new section. Visitors are charged $5 each unless they are there less than 30 minutes. The first time I called I was quoted full price for Saturday and the Passport rate for Sunday through Wednesday. At check-in the full price was for Saturday and Sunday and the Passport discount for Monday through Wednesday. I agree with the previous poster that the management needs to honor the mistakes of their employees (children?). We would not stay here again. We camped at Balsam Cove Campground in a Fifth Wheel. We spent 11 nights at this campground and thoroughly enjoyed our stay. The owners, couldn't have been more accommodating, friendly and efficient. Any question or request that we had was immediately met with a positive response. 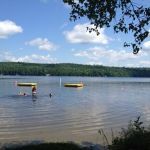 The campground is clean and well-kept and the renovations and improvements that have been done are obvious. The laundry is new and well-equipped and includes a well-stocked lending library. The bathrooms are slated to be totally redone but at the present time are clean, although dated. All utilities have recently been upgraded and a full commercial kitchen has just been installed in the pavilion in order to offer pizza and other items for campers' consumption beginning 2011. This campground is very family oriented with many planned activities, especially for children. We have a 33' motorhome and had a lovely roomy wooded site. We look forward to returning to this location in the future. We camped at Balsam Cove Campground in a Motorhome. We stayed in one of the new pull through 50Amp sites. They are very long and wide. The staff was friendly and we enjoyed the stay. There were two problems. 1, The Wi-Fi is extremely slow. 2. When I booked the reservation it was only for 4 days and I was given the Passport America rate. I called and extended the stay by one day. I was not told that this would be at the full rate since it was a Friday night. When I said something to the owner about this she said she had told here son to call me back and tell me, but he had not, so I could leave without staying or pay the full price. Since it was there mistake they should have at least given me a partial discount. We camped at Balsam Cove Campground in a Fifth Wheel. This campground is very clean. We can tell it has been completely renovated. Staff was very pleasant. This is definitely a family campground. The owners seem to love having the children and pets around. Activities revolve around families. A new kitchen has been added to the pavilion and the owners hope to have a "Pirate Ship" ready for tours on the pond for July 4th. We camped at Balsam Cove Campground in a Fifth Wheel. The park was clean and the staff was friendly. The owners dog was a Rottweiler which she said was a baby, but I wouldn't get near the dog. The trees had a lot of low branches that scratched the side of my coach as well as a 5er that passed by. We mentioned the low branches to the owners, but they said no one else complained and didn't seem as though they were going to do anything. We camped at Balsam Cove Campground in a Motorhome. We found this to be an attractive park, good WIFI at our site. Some sites might be a little tight to back in but we had no problems. A lot of work has been done here to improve the appearance and performance of things. The campground personnel were quite friendly and helpful. We would definitely camp here again. We camped at Balsam Cove Campground in a Fifth Wheel. 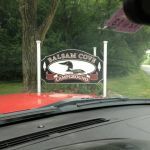 Are you affiliated with Balsam Cove Campground ?